Macro Minimalism is pretty different from the Long Range Street Minimalism that I mostly shoot. This Minimalist Photo is one from the Close Range Minimal shots category. I used the Canon 100mm prime Macro F 2.8 L Series Lens here. Settings: Taken on Manual Focus of Both the Camera and Lens. 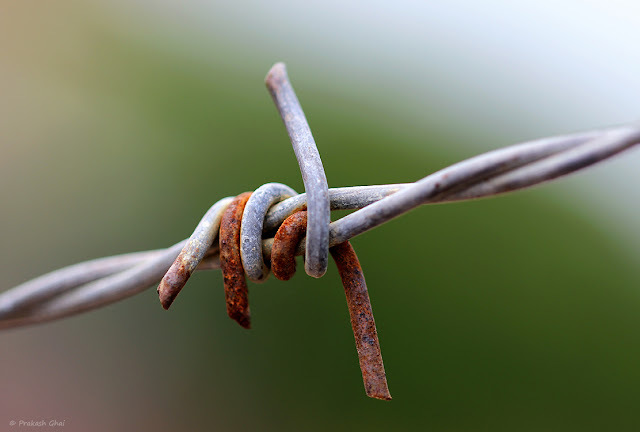 What prompted me to take this shot was the Rust in the Barb Wire. The subject is kept a touch off-center on purpose. The Blurry Background / Bokeh is a result of shooting this photograph at F 2.8 aperture. And Finally, The Photo falls under the Minimalism as Less Elements Category. Have a Great Day / Evening.